One of the benefits of living out of one's comfort zone (not that I'm in Papua New Guinea drinking water off of palm fronds) is that the different texture of daily life gives you more occasions to polish your rough edges and realize your blind spots. Yesterday, for example, JC and I were eating lunch in our usual spot, a hole-in-the-wall "cocina economica" (literally, economic kitchen). It's a concrete cavity off a side street, with exactly three small plastic tables (each covered with a plastic tablecloth), three chairs per table, and a long makeshift counter stacked with pots and bowls and good things a-simmering. The mistress of said establishment is Doña Clemens, a grandmotherly woman with a kind face and wrinkled hands accustomed to work. Her 30-something daughter Rosy is often there as well to make the "agua de frutas" and to lend her mother a hand. Both Doña Clemens and Rosy are evangelical Christians, and they live off of the occasional and regular customers who come for their daily ration of soup, chicken, rice, and dessert (jello or bananas topped with cream and sugar). JC and I are her faithful regulars, along with an accountant who eats quickly while watching the news on the antique TV set. Some of her occasional customers include a few other couples, some teenagers, and the odd transvestite (there are several in the area) who settle into their plastic chairs with a kind of sad languor. Anyway, yesterday it was just me, JC, and Olivia, chatting away with Doña Clemens while she slapped corn tortillas into shape and dished out our chicken with mole sauce (mole is a mixture of chocolate and chili - very delicious). The conversation turned to Olivia, who was sitting in her stroller, grabbing at the plastic tablecloth and examining it with interest. "Have you been eating avocados?" asked Doña Clemens from the other side of the long counter. "Well... yeah, I guess so. Why?" I answered, puzzled. "And has your baby had colic?" she asked. "Well, when you're breastfeeding and you eat avocados, you give your baby colic," she said. 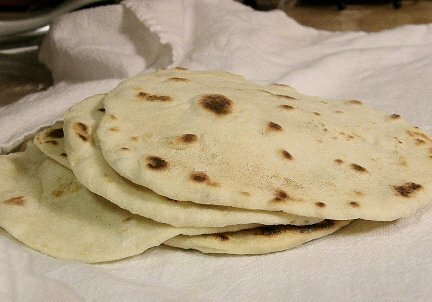 Slap-slap-slap went the tortillas. Comments like these always trigger a reaction in me. "Actually," I said with authoritative confidence, "that's just a myth. It's not true at all. I've eaten plenty of avocados and Olivia hasn't had a single problem." Silence fell in the cocina economica, broken only by the slapping sound of tortillas. JC was suddenly intently focused on his soup. Oh crap, I thought. I've done it again. Later that night, as JC and I lay forehead to forehead in bed, we talked about that moment (among others). "Did you notice the sepulchral silence that fell when you shot Doña Clemens down?" he asked. "Yes," I admitted, feeling a twinge of shame. I had been thinking about that vacuum of silence all day long. It had been nagging me like a lesson waiting to be learned. So I started to justify myself. "Well, it's just that... people tell me all kinds of stuff with absolutely no foundation." And I listed some of the other weird advice I'd been given, all of which was just old wives' tales. "If your belly is round during your pregnancy, you're going to have a boy. If you put a red thread on your baby's forehead, it will stop the hiccups. If you eat even a little bit of chili, your baby will get heartburn. If you... it's just nonsense! I wish people would stop giving me superstitious advice," I said, realizing as the words were coming out of my mouth that my reaction was narrow and unkind. To which JC responded, "A mi me da una especia de ternura (loosely translated: It touches my heart) when Doña Clemens and the others give us advice. I know it's not scientific, but it comes from a place of kindness, from a genuine desire to help you. And the advice they give is what they received from their mothers, all the way back through the generations. So there is also that generational bond behind it, a continuity from one mother to another. That's something beautiful, that family tie," he said, adding, "Try to see the love they are expressing, because it's real." At this, my heart felt stabbed with remorse. Such small daily events, and this is the wealth that my husband sees behind them. This is how he perceives other people-- in the goodness of their hearts, in their desire to be helpful, in their willingness to give. I, by contrast, just saw superstitious nonsense and went after it with a baseball bat of Scientific Righteousness. Wham! Wham! Wham! I'll flatten that myth like a tortilla! Smack! No old wives' wisdom for me! I'm a Modern Woman! And supposedly, as a Catholic woman I'm a "Humanizer of Humanity," right? Not even close. My husband is the perceptive one who gets the wider picture of hearts and good intentions, and chooses the right time to say the right thing... in just the right way. Seeing me become pensive and sad, he immediately began smirking and imitating me: "Actually, that's a MYTH! Actually, I read on Baby Center... Actually..." which made me laugh and feel so much lighter. "Ayy, güerita, güerita," he said. "What am I going to do with my gringa güerita? Te voy a dar tus nalgadas." Little lessons out of my comfort zone. I suppose in the States, I'd be just another Obsessive New Mom who wants to get everything right. But in Mexico, I'm something of a freak. I'm like the Obsessive New Mom raised to the fifth power. Okay. Something to work on, I guess. In spite of the occasional discomfort of "metiendo la pata" (putting my foot in it), I do feel grateful for these mistakes and lessons because I see the fingerprints of God's modus operandi all over them. Little invitations to deepen my perspective, widen my horizon, see the goodness in others... and when I fail, the correction comes seasoned with humor so that I can laugh at myself and move on. So... next time Doña Clemens or any other Mexican grandmother gives me Unscientific Advice, I will just say, "Thank you!" and mean it. Thank you for caring enough to want to help. Thank you for wanting to love my baby. Thank you for giving the difficult gringa another chance. And pass me the guacamole. Learning lessons is much of what life is about... Thanks for sharing! Nowadays, I just say, "Really? I never heard that," or "Well, this is working for now, but I'll keep that in mind." I work with a lot of the worst offenders, so of course I don't want to cheese anyone off.